Picture yourself the ancient Greek hero, King Leonidas. 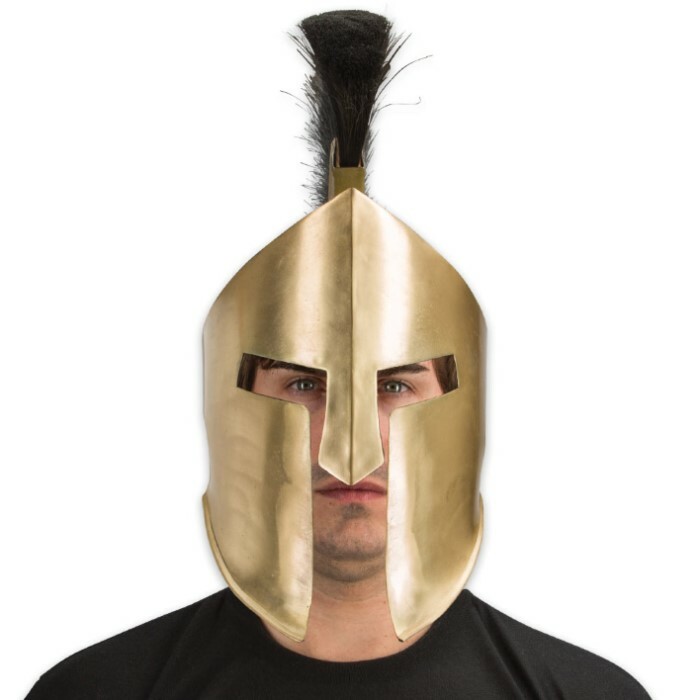 Outnumbered but not outmatched, you lead an elite band of 300 Spartan warriors to a strategic mountain pass near Thermopylae to await a fierce Persian horde led by power-mad King Xerxes. 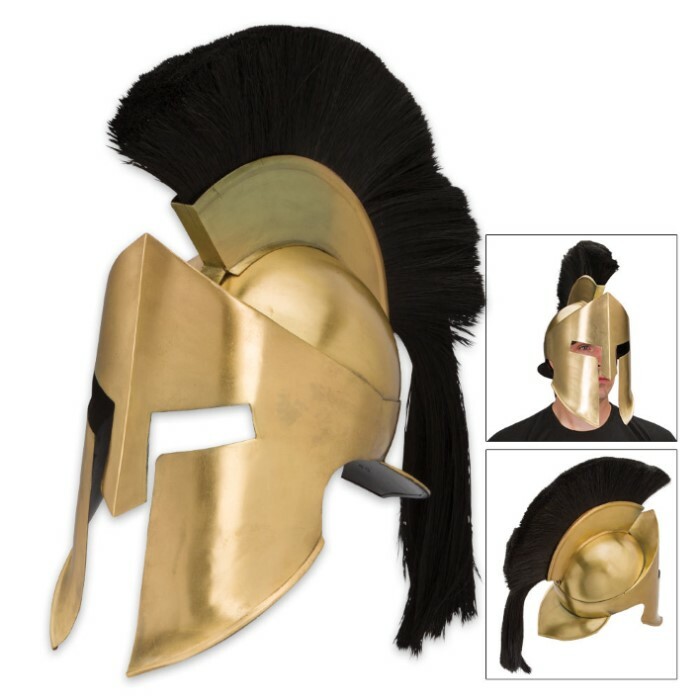 The only thing standing between you and the razor sharp scimitars of the Eastern fighters is your sword, a shield and gleaming bronze armor, including an elegant plumed helmet and face guard - not unlike our stately Spartan Crested Helmet and Facemask. This is no flimsy, kitschy replica. Its materials and construction are top notch - made to last a lifetime and beyond. The one-piece helmet and facemask is forged from thick 20 gauge steel, and the gracefully flowing, removable black parade plume is tough synthetic horsehair, carefully bound in a genuine leather spine. With its historically faithful design and authentic, wearable size, the Spartan Crested Helmet and Facemask is perfect for historical dramas, reenactments, cosplay, Greco-Roman conventions, Halloween and countless other costume applications. 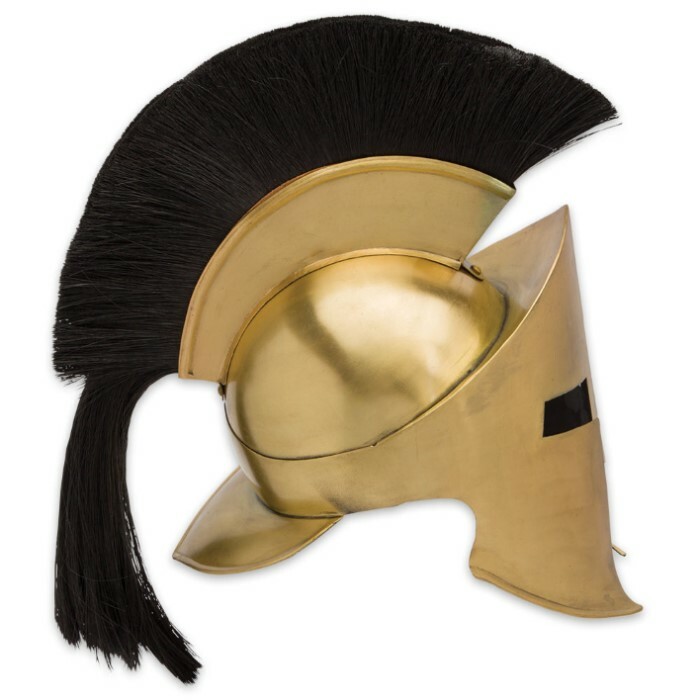 Its grand, eye-catching bearing makes it ideal for display, as well - in an ancient Greece or military history collection, or as a piece of distinctive, exotic home and/or office decor. It's big enough to get noticed and fits most adults. Measures: 16" from bottom of chin guard to top of horsehair crest; 12" from bottom of chin guard to facemask pinnacle; 8 1/2" ear to ear; 29 1/2" outside circumference; 25" inside (wearable) circumference; and 13 1/2" from front of chin guard to back of neck guard.